Voting apartheid was in full operation at Green Lane Polling Station today - with Sutton Voters (woo yay!) 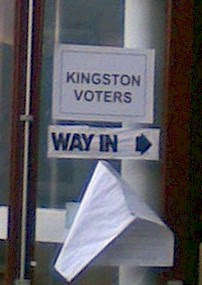 and Kingston Voters (boo hiss boo) shepherded through separate doors into the school hall, and left to exchange menacing glances over the makeshift barrier of school benches that divided the room in two. But as the votes continue to be case in the 'Ken -v- The Clown -v- The Other One' contest, voting closed in our monthly poll of the best watering hole in Worcester Park. April being over and done with, May's Monthly Poll gives you the chance to pluck the wart of your choice from the otherwise perfectly manicured feet of Worcester Park. Get voting on the 'Monthly Poll' on the right. You have until the end of May!